For other people with similar names, see Trevor Horne. Trevor Charles Horn, CBE (born 15 July 1949) is an English music record producer, songwriter, musician and singer. His influence on 1980s popular music was such that he has been called "The Man Who Invented the Eighties". Horn has produced commercially successful songs and albums for numerous British and international artists. He won a Grammy Award for producing "Kiss from a Rose" by Seal. As a musician, he has had chart success with the bands The Buggles, Yes and Art of Noise. He also owns a significant stake in the recording company ZTT Records, Sarm Studios and a music publishing company, Perfect Songs. The three are combined under the corporate umbrella of SPZ. In 2010 he received the British Academy's Ivor Novello Award for Outstanding Contribution to British Music. Horn began his professional career as a session musician in the late 1970s, including playing on the television show, Come Dancing. Most notably, he played for disco star Tina Charles and her producer Biddu, whose backing tracks were an influence on Horn's early work. Another member of her backing band was keyboard player Geoffrey Downes. In 1978, Horn and Downes formed The Buggles, in which Horn played bass, guitar and percussion as well as providing vocals, while the female vocalist was Linda Jardim (now Linda Allan). Just before The Buggles, however, Horn signed with Sonet Records and recorded two singles under the moniker of 'The Big A'. One single, "Caribbean Air Control", was released in the United Kingdom but failed to chart. A few months later, the song was remixed into a disco track under the name of "Chromium" ("Chrome" in the US) with no vocals and a synthesised and percussion backbeat. This also failed to chart, but did well in the disco clubs, especially in the US and Canada. In 1979, an entire album was released entitled Star to Star. Around this time Horn, Downes and Bruce Woolley (Tina Charles's guitarist) co-wrote "Video Killed the Radio Star", which was released by The Buggles in 1979; it reached No. 1 in the UK Singles Chart and was the first music video to be played on MTV. The song also appeared on the group's first album, The Age of Plastic, released in 1980. 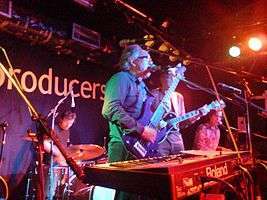 Trevor Horn performing with the Producers in 2012. Horn did work with Yes again, not as a band member, but (co-)producing their next two studio albums, including the 1983 "comeback" album 90125. He also went on to be a founding member of the Art of Noise. He is known for performing on albums that he produces. His latest band is Producers, in which Horn plays with various musicians/producers, namely Lol Creme, producer Steve Lipson, drummer Ash Soan and initially singer/songwriter Chris Braide. The band performed its first gig at the Camden Barfly in November 2006. They continue to perform, now under the name the Trevor Horn Band. Horn (sometimes working with Geoff Downes) was the producer of the Buggles material, and during his tenure with Yes, Horn helped produce their releases. (official production credit on Drama was given to Yes and engineer Eddy Offord). He continued working with Yes on and off as a producer, including on the album 90125 and the hit single "Owner of a Lonely Heart". Asked in a 2015 interview about what he considers his best work over the years, Horn named "Owner of a Lonely Heart" from a technical point of view. Horn's first outside production success came with the pop band Dollar in 1981 and 1982. Four UK Top 20 singles, "Mirror Mirror", "Hand Held in Black and White", "Give Me Back My Heart" and "Videotheque" were all co-written and produced by Horn. He then went on to produce The Lexicon of Love (1982) by ABC, which reached No. 1 in the UK Albums Chart. It was during the Lexicon sessions that Horn first assembled the production team that would characterise and define the sound of a Horn production in the 1980s: Anne Dudley on keyboards and arrangements, Gary Langan (later Stephen Lipson) as chief engineer, J. J. Jeczalik on programming for the Fairlight CMI, backing vocalist Tessa Webb plus percussionist Luis Jardim. Originally brought in to play keyboard, Dudley was soon co-writing with the group and scoring the album's orchestrations. He achieved his greatest commercial success in 1984, firstly with the Liverpudlian band Frankie Goes to Hollywood. He was approached by Bob Geldof to produce the song "Do They Know It's Christmas? ", but he was unavailable. Instead, he gave use of his studio, SARM West in London, free of charge to the project for 24 hours, which Geldof accepted, assigning Midge Ure as the producer instead. On 25 November 1984, the song was recorded and mixed. Horn did produce the B-side featuring messages from artists who had and had not made the recording (including David Bowie, Annie Lennox from Eurythmics, Paul McCartney, all members of Big Country and Holly Johnson from Frankie Goes to Hollywood), which were also recorded over the same backing track as the A-side. Other artists he has produced include John Howard, Paul McCartney, Tom Jones, Cher, Grace Jones, Seal, Propaganda, Tina Turner, Lisa Stansfield, Pet Shop Boys, Simple Minds, Eros Ramazzotti, Mike Oldfield, Marc Almond, Charlotte Church, t.A.T.u., LeAnn Rimes, Genesis and Belle & Sebastian. Several musicians have described Horn's style of production as dominating. Frankie Goes to Hollywood's debut album Welcome to the Pleasuredome barely featured any of the band's performances, instead featuring Horn and session musicians (lead single "Relax" cost £70,000 spent across three sessions that included scrapped versions by the band and by Ian Dury's backing band, before Horn re-recorded the song himself); and the Pet Shop Boys remarked that although Horn had promised to complete their single "Left to My Own Devices" in a couple weeks, it took several months for them to receive the final mix due to the lavish live orchestration and studio work. On 11 November 2004, a Prince's Trust charity concert celebrating Horn's 25 years as a record producer took place at Wembley Arena. Performers at the show included The Buggles, Bruce Woolley, ABC, Art of Noise, Belle & Sebastian, Lisa Stansfield, Pet Shop Boys, Seal, Dollar, Propaganda, t.A.T.u., Yes, Grace Jones and Frankie Goes to Hollywood (with Ryan Molloy replacing original vocalist Holly Johnson). A double album, Produced by Trevor Horn, was released in conjunction with the concert. An edited version of the concert has been broadcast on television in several countries under the title 25 Years of Pop: Produced by Trevor Horn, and a DVD release of the full concert called Slaves to the Rhythm is available. On 22 May 2006, the Pet Shop Boys released their album Fundamental which was produced by Horn. The album reached No. 5 in the UK chart. In the same month, he featured in a Pet Shop Boys concert specially recorded for BBC Radio 2. Following the critical success of the event Horn has produced an album version, Concrete, released on 23 October 2006. Horn also produced Captain's debut album, This is Hazelville, released late 2006. He has also worked with John Legend and David Jordan. For the 2008 movie Wanted (starring James McAvoy and Angelina Jolie), Horn produced Danny Elfman's vocals on the closing credits song "The Little Things". In 2009, Horn produced the album Reality Killed The Video Star for British singer Robbie Williams. Aside from the album title paying homage to Horn's hit single with The Buggles back in 1979, it also reflects Horn and Williams' mutual disdain for the ongoing crop of reality television and music contest programmes in the UK and elsewhere. Ironically, the album was Williams' first studio album not to reach number 1 in the UK, beaten to the top spot by the debut album by JLS, who were runners-up on television's The X Factor in 2008. Horn is also the executive producer of Jeff Beck's album, Emotion & Commotion, released in early 2010. He is returning to work with Yes again, producing their new album from October 2010. That album, 2011's Fly From Here, is a reunion of sorts for Horn's former bandmate Geoff Downes; not only is Downes a member of the band's current incarnation, but the album also takes its title from a song written by Horn and Downes during their original stint with Yes in the 1980s. Horn's songwriting credits date back to 1979 when he co-wrote a song for Dusty Springfield, "Baby Blue" with Bruce Woolley and Geoff Downes. All the Buggles' hits – including "Video Killed the Radio Star", "Living in the Plastic Age", "Elstree" and "I Am a Camera" – were co-written by Horn and Downes. Horn co-wrote all of the 1980 Yes album, Drama. On his return to the band (as producer) in 1983 he contributed to their biggest hit, "Owner of a Lonely Heart" and the dance hit "Leave It"; still later, he would co-write about half of the tracks on their 2011 album Fly from Here, much of which was based on a song he had written with Downes back in the Drama era, just prior to joining the band. For Dollar's The Dollar Album (1982), Horn wrote a love story across four songs: "Hand Held in Black and White", "Mirror Mirror", "Give Me Back My Heart" and "Videotheque". All four singles reached the UK Top 20, and two, "Mirror Mirror" and "Give Me Back My Heart", reached No. 4 in the UK chart. During 1982 and 1983, Horn worked with Malcolm McLaren and Anne Dudley, writing numerous worldwide hits including "Buffalo Gals", "Double Dutch", "Duck for the Oyster" and the Duck Rock album. In 1984, he co-wrote several hits with the Art of Noise including "Close (To the Edit)", "Beat Box" and "Moments in Love". The next year he co-wrote "Slave to the Rhythm". This was originally intended as Frankie Goes to Hollywood's second single, but was instead given to Grace Jones. Horn and his studio team reworked and reinterpreted it, jazz style, into six separate songs to form the album Slave to the Rhythm. Horn also contributed to the album by approaching David Gilmour, who ultimately played guitar on it. In the 1990s, Horn wrote two songs for solo female singers. "Riding into Blue (Cowboy Song)" was recorded by Inga Humpe and "Docklands" which was recorded by Betsy Cook. He also co-wrote two songs with Terry Reid for his 1991 album, The Driver and "The Shape of Things to Come" for Cher's 1995 album It's a Man's World. Horn co-wrote the theme song "Everybody Up" to the TV programme The Glam Metal Detectives, a comedy sketch show which appeared on BBC Two in 1995. This was another collaboration with Lol Creme. Horn's songwriting can be heard on numerous film soundtracks. In 1992, Horn collaborated with composer Hans Zimmer to produce the score for the movie Toys, which included interpretations by Tori Amos, Pat Metheny and Thomas Dolby. In the 2000s, Horn provided additional production on three international hits for t.A.T.u., "All the Things She Said", "Not Gonna Get Us", and "Clowns (Can You See Me Now)". He also co-wrote "Pass the Flame" (the official torch relay song for the 2004 Olympics in Athens) in collaboration with Lol Creme and co-wrote the title track from Lisa Stansfield's 2004 album The Moment. He co-wrote 'Sound The Bugle', performed by Bryan Adams and featured on the Spirit: Stallion of the Cimarron soundtrack. The first to be signed were Frankie Goes to Hollywood, followed by the Art of Noise and Propaganda. These first few signings to the company were instrumental in establishing the company ethos of "innovation and artiste development, taking risks and signing acts far into the left field". Successful songwriters he has signed since include Seal, Ian Brown, Gabrielle, Chris Braide, Shane MacGowan, Marsha Ambrosius, Alistair Griffin, and Paul Simm (writer of the hit "Overload" for Sugababes). Horn was appointed Commander of the Order of the British Empire (CBE) in the 2011 New Year Honours for services to the music industry. Honorary degree of Doctor of Music (2012) by Southampton Solent University, England. Horn married former mathematics teacher and business partner Jill Sinclair in 1980. They have four children; two sons, Aaron and William, and two daughters, Gabriella and Alexandra (or "Ally"), the latter of whom has worked as a trainee solicitor. Aaron (known in the industry as "Aaron Audio"), like his father, is a musician and producer. He works with his band, Sam and the Womp and frequently DJs around London. Both Aaron and Ally Horn are co-directors of Sarm Studios. As of August 2016, he has three grandsons. On 25 June 2006, while at home from Goldsmiths College, University of London, Aaron was practising with his air rifle, not realising his mother was close by. A 4.5 mm (.17 calibre) air gun pellet accidentally hit Jill in the neck, severing an artery and causing irreversible brain damage from hypoxia, leaving only her lower brain functions and no chance for recovery. She was rushed to the Royal Berkshire Hospital intensive care unit where her condition was described as "critical but stable". Communication from ZTT Records confirmed on 1 September 2006 that Jill was in a natural coma and had been moved to a rehabilitation centre. In September 2009, Horn told The Times that he preferred not to answer questions about his wife, but confirmed that she was still in a coma. In June 2012, Horn told The Sunday Times that his wife was not in a coma, but, "She cannot speak, move, or smile. The only expression she can show is of discomfort." Jill Sinclair died of cancer on 22 March 2014, aged 61. ↑ Archived 10 September 2009 at the Wayback Machine. ↑ "Interview: Trevor Horn". The Stool Pigeon. 2 February 2012. Retrieved 26 March 2014. ↑ "Trevor Horn: the man who invented the Eighties". The Times. 17 August 2013. 1 2 Tobler, John (1992). NME Rock 'N' Roll Years. (1st ed.). London: Reed International Books Ltd. p. 342. CN 5585. ↑ "2010 Ivor Novello awards: The winners". BBC News. 20 May 2010. Retrieved 9 November 2014. ↑ "Buggles". Multinet.no. Retrieved 26 March 2014. 1 2 "The Art of Noise Online". Theartofnoiseonline.com. Retrieved 26 March 2014. ↑ Warner, Timothy (2003). Pop music: technology and creativity. Ashgate Publishing. p. 155. ISBN 0-7546-3132-X. Retrieved 21 June 2011. ↑ Roberts, David (2006). British Hit Singles & Albums (19th ed.). London: Guinness World Records Limited. p. 85. ISBN 1-904994-10-5. ↑ "Archived copy". Archived from the original on 7 February 2016. Retrieved 2015-04-07. ↑ Tobler, John (1992). NME Rock 'N' Roll Years (1st ed.). London: Reed International Books Ltd. p. 368. CN 5585. ↑ Tobler, John (1992). NME Rock 'N' Roll Years (1st ed.). London: Reed International Books Ltd. p. 438. CN 5585. ↑ "Garbo talks, Danny Elfman sings". Latimesblogs.latimes.com. 10 June 2008. Retrieved 26 March 2014. ↑ Archived 25 December 2009 at the Wayback Machine. ↑ "The Rightful Heir?". Q Magazine No. 48. September 1990. Retrieved 23 July 2011. ↑ "International Catalogue: Perfect Songs". Mushroom Music Publishing. 2004. Retrieved 2 October 2007. ↑ The London Gazette: (Supplement) no. 59647. p. 7. 31 December 2010. ↑ "Pop producer Trevor Horn appointed CBE". BBC News. 31 December 2010. ↑ Archived 27 September 2012 at the Wayback Machine. ↑ "Music maestro awarded honorary degree". Southampton Solent University. Retrieved 17 February 2013. ↑ "Archived copy". Archived from the original on 10 October 2016. Retrieved 2016-08-25. ↑ Kay, Richard (29 August 2007). "Tragic music mogul Trevor Horn in estate agent fees battle". Daily Mail. London. ↑ "Sam & The Womp | Bom Bom | Out Now!". Samandthewomp.tumblr.com. Retrieved 26 March 2014. ↑ Hodgkinson, Will (26 September 2009) "Can Trevor Horn weave magic for Robbie Williams?" Archived 15 June 2011 at the Wayback Machine.. The Times. ↑ Rayner, Gordon (25 March 2014). "Record company boss Jill Sinclair, wife of Trevor Horn, dies eight years after shooting accident". The Daily Telegraph. London. Retrieved 26 March 2014. ↑ "Archived copy". Archived from the original on 26 December 2015. Retrieved 2015-12-25. ↑ Montague, A (31 August 2007). "The band with 200 hits behind them". The Jewish Chronicle. Retrieved 21 February 2014. Wells, E (30 September 2007). "The Hit Factory". The Times. UK. Retrieved 2 October 2007. "Living in the Plastic Age"